With a high approval rating (70%) under his belt, riding a popularity wave upon completion of first hundred days of his presidency and enjoying the celebratory atmosphere, a confident President Obama delivered a damning verdict on Pakistan government. “I am gravely concerned about the situation in Pakistan, not because I think they that are going to be overrun and the Taliban will take over in Pakistan, more concerned that the civilian government there right now is very fragile and don’t seem to have the capacity to deliver basic services: schools, health care, rule of law, a judicial system that works for the majority of people. And so as a consequence it is very difficult for them to gain the support and the loyalty of their people”, he said. He was responding to a question about the dangers of Pakistan’s nuclear arsenal falling into the Taliban hands in view of their menacing advances deep into the Pakistan’s settled areas of North Western Province. The remarks clearly targeted President Zardari, who completely monopolizes power and is believed by a great majority of Pakistanis to be America’s handyman, amply illustrated by the fact that he is visiting Washington instead of the prime minister. Richard Holbrooke, US special envoy for Pakistan and Afghanistan, moved in to do damage control at the behest of Pakistan Embassy by trying to white wash Obama’s statement in a briefing for the Pakistani media, saying: “what was stated is not true”. Holbrooke’s denial was ill advised. He was denying Obama’s statement that had been carried live by networks around the world, including Pakistan. Obama was neither caught off guard nor were these remarks made off the cuff. He was answering questions at a press conference in the White House for which he is well briefed and prepared in advance. His comments were well thought out, deliberate and carried several messages. Significantly, his comments came just before President Zardari arrived in Washington to meet him and his team to discuss Pakistan’s role in the Afghan war and the strategy to deal with Taliban insurgency in Pakistan. It is unusual for one head of government to berate another in public, particularly when both countries claim friendship and are engaged in war against a common adversary. But that happens when both are not equally placed. In this case the mentor was registering his frustration with the disciple for failure to carry out his bidding. The message to Zardari about his inability to deal with the Taliban, his political blunders, failed domestic policies and the loss of public support is being interpreted as a hint that his marching orders may soon be out. Obama cannot afford to see Pakistan pushed into civil unrest at this time as that endangers American interests in Afghanistan. Therefore Zardari government could prove to be a liability. There is little doubt that Zardari had difficulty explaining his position to his mentors. While he tried to appear in command and made promises of renewed military action against the Taliban during his meetings and to the media, these carried little value in the absence of an endorsement by Pakistan’s military chief who remains the key decision maker. Zardari is no position to take independent decisions concerning the Army. He exercises little control over this all powerful service which lacks faith in his ability to provide leadership and does not hesitate to over rule him when he makes error of judgment. 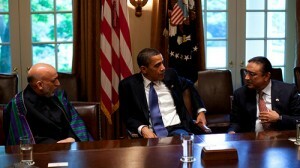 Whispers were heard in Washington last week that Zardari must improve his performance to keep his job. This came amid rumors that Obama administration may not be averse to the idea of change of guard in Islamabad, having realised that he was after all not the best choice after Benazir Bhutto was assassinated and into whose position he leapfrogged. Secretary of State Hillary Clinton has already said: “In Pakistan, it’s a very difficult environment because of the confusion among the civilian and military leadership about how to prioritize what is the greatest threat to Pakistan going forward.” And then General Petraeus apparently drove a wedge between Zardari and the army chief General Kayani when he called Pakistan Army to be “superior” to the “civilian government led by President Zardari”. Direct communication now exists between the Pentagon and the Pakistan Army. Secretary Gates and General Petraeus have been working hard to create the new Pakistan military funding stream: a $3 billion ‘Pakistan Counterinsurgency Capability Fund’, which will effectively bypass the US State Dept. and Pakistan’s civilian establishment. They had scrambled in response to Pakistan Army’s message that it will run out of funds to fight the insurgency by May this year. Interestingly, President Obama sounded less concerned about the security of Pakistan’s nuclear arsenal this time despite the Taliban threat. During the press conference he said: “I am confident that we can make sure that Pakistan’s nuclear arsenal is secure. Primarily, initially, because the Pakistani Army, I think, recognizes the hazards of those weapons falling into the wrong hands. We got strong military to military consultation and cooperation”. President Obama struck a note of optimism by placing reliance on Pakistan Army for the safety of nuclear arsenal without mentioning the civilian government. This he apparently did for several reasons. Firstly, it is the Pakistan Army which is, in fact, relevant to the control of the nukes and not the current civilian administration. Secondly, recent direct military to military contacts have raised the comfort level of the Americans with the Pakistan Army after a stormy relationship over the Pakistan military’s Inter Services Intelligence agency’s role in Afghanistan that seems to have now been set aside. And thirdly, the Americans having been involved with creating the Command & Control set-up for Pakistani nukes and apparently enjoying some sort of leverage in matters related to their dispersal and security measures, are more assured than before. Relations with India being a matter of foreign policy fall in the domain of the civilian government. The army being an instrument of the country’s foreign policy is required to follow instructions of the civil government. An American president attributing a major shift in Pakistan’s foreign policy to Pakistan Army, rather than to the civil government, is most unusual. If indeed Pakistan Army recognizes its threat perception of India as ‘misguided’ and is consequently making an independent judgment to change course, this raises several questions: where is the civil government in all of this? Is the civil government even aware that behind its back key elements of its foreign policy are being rewritten? Has America reached an understanding with India to scale down its military presence on Pakistan’s borders and has given a go-ahead to Pakistan Army to redeploy its troops to fight insurgency? Why have the people of Pakistan not been taken into confidence? And the biggest question of all is: Are we are witnessing two governments in Islamabad – one de facto that America prefers to deal with and the other de jure which America may be seeking to dump? This makes one thing very clear though. Zardari has flung out of the loop despite the best face he is putting up and despite the confidence that Obama has shown in the wake of the Washington meetings. Mincing no words, Obama wants Pakistan to play ball or else…. This article appeared in the Pakistan daily Dawn on May 9, 2009.